ON THIS DATE (May 19, 2008) ... Tonight Jon Lester threw a no-hitter, blanking the Kansas City Royals, 7-0, at Fenway Park. Jon Lester is 24 years old. He’s a cancer survivor. He’s the winner of the clinching game of the 2007 World Series. Now he’s the first Sox lefty to throw a no-hitter since Mel Parnell turned the trick against the Chicago White Sox in 1956. It was the first complete game of Lester’s major league career. Lester’s gem came on a chilly Fenway weeknight and was saved by a sensational fourth-inning catch by rookie center fielder Jacoby Ellsbury. Super-skilled Royals outfielder Jose Guillen looped a two-out shot into shallow center that looked like a base hit until the fleet Ellsbury raced forward, dived, and got his glove down to make the catch. Lester dominated the Royals from the start. He threw first strikes to 18 of 28 hitters. He fanned eight batters overall, including seven over the last five innings. He walked only two. He threw a career-high 130 pitches. Lester’s masterpiece was the fourth no-hitter caught by Sox backstop Jason Varitek, breaking a major league record. Entering tonight's contest, Varitek and 12 other big league catchers had the distinction of catching three no-hitters in their careers. The moment Kansas City's Alberto Callaspo swung and missed at Lester's 130th pitch, Varitek stood all alone in the history books. Ever since he assumed the Red Sox's full-time catching duties in 1999, Varitek has commanded the respect and admiration of every pitcher from Pedro Martinez to Curt Schilling to Josh Beckett. And before Monday night, he caught no-hitters from Hideo Nomo in 2001, Derek Lowe in '02 and Clay Buchholz last Sept. 1st. Varitek, as he always does, did his best work as the game moved along, helping Lester overcome a bullpen session beforehand that left the southpaw feeling less than confident about his stuff. 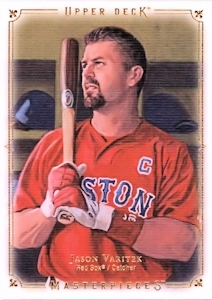 But calling a game that featured Lester's curve and high fastballs mixed in with a steady stream of the lefty's signature cut-fastball, Varitek helped his pitcher find a rhythm as the game unfolded. When it was over Varitek simply pumped his fist in the air and rushed out to congratulate his pitcher after not allowing a hit, something the Red Sox's captain has done that more than any catcher in Major League history.